President-elect Barack Obama’s newly appointed chief of staff, Rahm Emanuel, served on the board of directors of the federal mortgage firm Freddie Mac at a time when scandal was brewing at the troubled agency and the board failed to spot “red flags,” according to government reports reviewed by ABCNews.com. According to a complaint later filed by the Securities and Exchange Commission, Freddie Mac, known formally as the Federal Home Loan Mortgage Corporation, misreported profits by billions of dollars in order to deceive investors between the years 2000 and 2002. Freddie Mac agreed to pay a $50 million penalty in 2007 to settle the SEC complaint and four top executives of the Federal Home Loan Mortgage Corporation were charged with negligent conduct and, like the company, agreed to settle the case without admitting or denying the allegations. The actions by Freddie Mac are cited by some economists as the beginning of the country’s economic meltdown. The federal government this year was forced to take over Freddie Mac and a sister federal mortgage agency, Fannie Mae, pledging at least $200 billion in public funds. Freddie Mac records have been subpoenaed by the Justice Department as part of its investigation of the suspect accounting procedures. Emanuel was named to the Freddie Mac board by President Bill Clinton in 2000 and resigned his position when he ran for Congress in May, 2001. The role of the 18-member board of directors, including Emanuel, was not addressed in the SEC’s public action but was heavily criticized by the oversight group (OFHEO) in 2003. 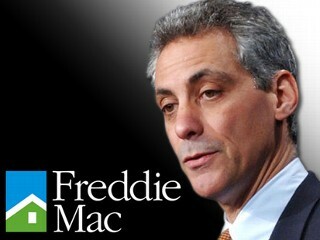 As a Congressman, Emanuel recused himself from any votes dealing with Freddie Mac until just this year. In dealing with the nation’s economic crisis, the new White House chief of staff will almost certainly be involved in discussions about the house and mortgage markets.